The Indypendent and The Occupied Wall Street Journal have teamed up to publish a special issue one week before New York’s pivotal Democratic primary contest between Senator Bernie Sanders and former Secretary of State Hillary Clinton. 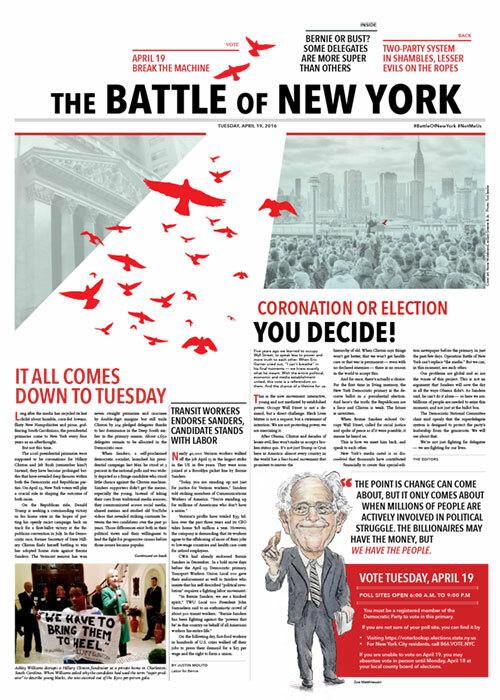 Called The Battle of New York, the extra-large four-page broadsheet is beautifully designed and illustrated. 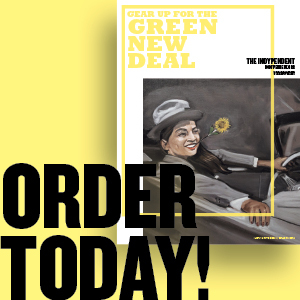 It features contributions from a number of prominent progressive voices including Cornel West, Michelle Alexander, Glenn Greenwald, Greg Grandin, Jodi Dean, Ray McGovern and Nancy Romer as well as choice words from Sanders himself. 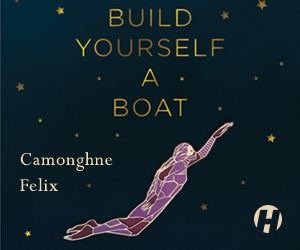 Hundreds of thousands of copies have been printed and a PDF version is now online as well. The paper has been made possible by the online contributions to date of more than 1,600 supporters who responded to a crowd-funding appeal by the paper’s editors that continues until Monday. The Battle of New York was first released at a massive Sanders rally on Wednesday evening at Washington Square Park in lower Manhattan. More than 40,000 papers were distributed. A second edition of the paper will be published this weekend and includes updates on Sanders’ support for striking Verizon workers and his Friday visit to The Vatican. The Battle of New York’s central distribution hub is located on the ground floor at The Brooklyn Commons at 388 Atlantic Avenue. Thousands of copies are also available at The May Day Space in Bushwick, Brooklyn. Readers are encouraged to take papers to share in their neighborhoods, schools, local subway stations, etc. The paper will also be distributed at Sanders campaign events this weekend and there will be a major distribution push at transit hubs across the city on Monday morning. To join in that, please visit the Battle of NY Street Squads Facebook page. New Yorkers begin voting in about 72 hours. Let’s make the most of this unique resource for educating and inspiring our fellow New Yorkers! Note: We have incurred significant expenses with this project and are still more than $11,000 short of meeting our fundraising goal with only two days left in our indiegogo campaign. Please consider donating if you have not already done so. For more about The Indypendent, click here.